TV channels aired a video clip in which P S Sreedharan Pillai purportedly said the Sabarimala temple head priest consulted him before threatening the closure of the shrine if women in 10-50 age group entered it. Bharatiya Janata Party Kerala unit chief P S Sreedharan Pillai courted a controversy on Monday as TV channels aired a video clip in which he purportedly said the Sabarimala temple head priest consulted him before threatening the closure of the shrine if women in 10-50 age group entered it. As his remarks at a BJP Yuva morcha event in Kozhikode on Sunday drew strong reactions from the Communist Party of India (Marxist)-led ruling Left Democratic Front and opposition Congresss, Pillai, an advocate practicing in the Kerala high court, said the priest had called him seeking a legal clarification, which he had given. However, Head priest Tantri Kandararu Rajeevaru told reporters at the temple that he had only consulted senior tantri Kandararu Mohanararu on the matter. Hitting out at the BJP, Chief Minister Pinarayi Vijayan said at a public meeting in Kannur that the genuine devotees of Lord Ayyappa should understand the saffron party's 'game plan'. Responding to the criticism against him, Pillai said several people come to him for consultations and he as a lawyer had all the right to give them legal advice. 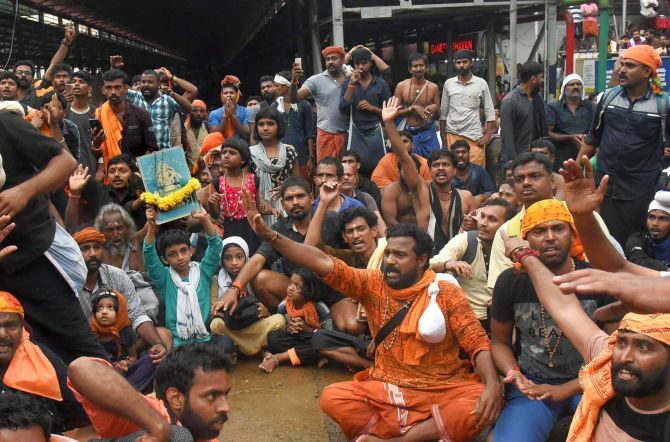 At the height of dramatic protests against entry of women of menstrual age into the Lord Ayyappa shrine, Tantri Kandararu Rajeevaru had on October 19 threatened to shut the sanctum sanctorum if two young women, then escorted by police, were allowed to reach the 'Sannidhanam' (temple complex). Police later escorted back the two women, including an activist, who attempted to enter the temple after the Supreme Court allowed women of all age groups to offer prayers. The BJP and Congress have opposed the CPI(M)-led LDF government's decision to implement the apex court order and not to seek a review of it as demanded by various quarters. In the video, Pillai was purportedly heard saying that the priest had consulted him on whether closing the Ayyappa temple if women tried to enter it would amount to contempt of court. Pillai had said he assured the tantri that there would be no contempt and thousands of believers were with him. "Sabarimala issue is a golden opportunity for us," he had told the party workers, claiming that the agitation was 'BJP's agenda'. During October 17-22 when the temple opened for monthly puja, the first time after the apex court verdict, devotees and right wing activists staged protests and prevented around 12 women in the 10-50 age group from entering the shrine. Slamming Pillai for his remarks, CPI-M state Secretary Kodiyeri Balakrishnan said it was a serious matter and demanded a high-level probe into what he called 'all conspiracies' related to Sabarimala and the stand taken by the BJP. The agitation was 'well planned' by BJP and the fact that the party could 'influence' the priest was 'serious', he said. State Devaswom Minister Kadakampally Surendran said Pillai's statements were an 'open challenge' to society and to the Supreme Court, while Industries minister E P Jayarajan accused the BJP of using the tantri and other priests for creating trouble at the holy hill. BJP was trying to turn the 'secular Kerala' into a 'riot zone', Surendran alleged, adding there was a conspiracy behind it and those involved should be brought to book. Leader of the Opposition in the state assembly and senior Congress leader Ramesh Chennithala said the real agenda of BJP had been exposed through the video. Kerala Pradesh Congress Committee president, Mullappally Ramachandran told reporters that the remarks of Pillai were 'dangerous'. Through his words, it had been proved that BJP was trying to create an Ayodhya in Kerala using the Sabarimala issue, he alleged. The issue surfaced on a day when the temple opened for a special puja to be performed on Tuesday. Should courts intervene in religious matters?